Dr. Aaron Bruce, serves as the Chief Diversity Officer and Vice President at ArtCenter College of Design where he focuses on campus-wide multicultural understanding, social justice, and strategies related to diversity, equity and inclusion. In addition to developing ways of improving campus climate, Dr. Bruce helps strengthen the college’s connection to diverse local and global communities and corporations. His experience in the advertising and marketing affords him with the creative energy to promote diversity and inclusion in a variety of ways. He presently is a member of the National Association for Diversity Officers in Higher Education (NADOHE), and former President of the Southern California Association of Diversity Officers in Higher Education (SCADOHE). He is a International Multicultural Institute certified diversity trainer, who has facilitated numerous professional development seminars in the U.S. and abroad. Dr. Bruce has held management positions in Latin America and Africa. His passion for global understanding has afforded him with opportunities to conduct research on management strategies, public health and education in Cuba, Mexico, and Kenya. Prior to joining ArtCenter Dr. Bruce served as the CDO at San Diego State University for over a decade. Helped the university earn the ranking of one of the nation top 5 campuses for study abroad. His strategic efforts helped to significantly close the achievement gap for underrepresented students. During the Global Student Leadership Summit, Dr. Bruce will engage in conversation with participates to address the question How does global education support the equity and advancement of student leaders? Through a dynamic keynote and dialogue students will leave recognizing and remembering all the benefits they’ve acquired through their participation in global experiences. Democracy Prep is national network of high-performing charter schools which strives to be a proof-point for what is possible in public education, including global educational travel opportunities for underrepresented high school students. Among Democracy Prep’s high school student body, 98% are students of color, 75% qualify for free or reduced-price lunch, and many will be the first in their family to matriculate to and through college. The Global Citizens Program at Democracy Prep was designed so that students would have the opportunity to see the world, and themselves in it. In 2019, over 400 students from Democracy Prep’s seven high schools will travel to Ecuador, France, Italy, Senegal, South Africa, and South Korea on short-term, leacher-led programs. Through strategic budgeting and thoughtful allocation of funds, Democracy Prep is able to cover an average of 85% of all costs for each student participant. By the time they graduate, more than 60% of Democracy Prep alumni have traveled abroad at least once during high school. As a result of this exposure, students gain an appreciation that there is no corner of the world to which they do not have access or in which they cannot be successful. He Waka Eke Noa – we are all in this canoe together without exception. This whakatauki (proverb) is the name given to the University of Auckland diversity and inclusion strategy, led by Lydie Faure Kilgannon and the 360 International team, which reflects what the University is trying to achieve through overseas opportunities: inclusion without exception. Our consultation paper has identified finances (scholarship and income), customs, perceptions of value and programming as barriers and we have set actions and objectives to address these. We’ve recently changed our scholarship strategy and seen applications from our underrepresented cohorts triple as a result. We’ve been very successful at working with our government’s main funding programmes to offer fully funded opportunities to all our students with some programmes entirely dedicated to our Māori students. We are developing targeted exchange as well as short term programmes to allow those students caring for families to take part. We are partnering with key academics and influencers to highly encourage students to participate in overseas programmes. We are ensuring that Māori and Pacific demographics are represented amongst our staffing. With their input, we have rolled out a diversity campaign which included targeted posters featuring recipients of our Māori and Pacific Awards, the Head of our Māori and Pacific faculty and Māori students who are keen to share how their overseas experience was made accessible and helped to shape their futures. Our strategies have paid off as we reached 13% participation this year compared to a mere 5.7% only 2 years ago. In that same time period (2010-2017) our education abroad program enrollment of minority students grew from 13.3% to 27.7%. In other words, the percentage of our education abroad students from underrepresented groups has grown commensurate with our institutional diversity. Also, the percentage of students studying abroad who are low income (EFC<1000) has also grown along with our institution’s growth in this category. This year 28.4% of our education abroad students were from low income backgrounds, compared with 29% overall at SUNY Oswego. Again, we are growing education abroad comparably with our student population overall for students from low income households. partnering with our campus Educational Opportunity Program (EOP) to take active steps to encourage deserving EOP students to participate in education abroad through outreach programs, dedicated advising, and by waiving the required deposit. Since 2006 the Latinx Health Internship Quarter Abroad Program has introduced first generation, ethnically, religiously, and racially diverse students to health disparities, traditional ways of healing, and public health practices in Oaxaca, Mexico. This program also promotes cultural humility, linguistic competence, and helps students clarify their future health career goals. We aim to promote global health and promote cultural exchange among our students and with our partners in Mexico. 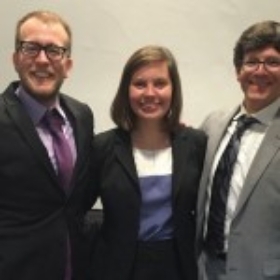 Katrina Joy Harrison is a second-year student at the University of Pittsburgh School of Law pursuing a JD and a certificate in International and Comparative Law. Additionally, Katrina is the Graduate Intern for the Vira I. Heinz (VIH) Program for Women in Global Leadership where she advises first-time, underrepresented women travelers as they embark on their first international experiences. Katrina is an alumna of the VIH Program, having received the award in 2014 to study in Bangalore, India. She has since also studied in Galway, Ireland and plans to spend her final year of law school at the Sorbonne in Paris, France. Nam Nguyen is currently a senior at Washington State University (Pullman, WA) pursuing double degrees in International Business and Marketing. Nam stands out as the first and only student in WSU’s 128-year history to study abroad on all seven continents. Studying abroad allows Nam to gain new experiences, as well as exposing him to an entirely different ideologies. He believes that studying abroad has helped him learn more about himself as an individual, in addition, it enabled him to embrace his own culture through different lens. He is also a Ronald E. McNair Scholar, Carson Fellow, Harold Frank Engineering Entrepreneurship Institute Fellow, and a NUFP Fellow with NASPA, the national professional association for student affairs professionals. Nam was recently recognized by NASPA with the Region V Undergraduate Rising Star Award. He loves exploring new ways of thinking and has a thirst for learning, developing, and succeeding. Born and raised in a small town in southern Vietnam, Nam is fluent in Vietnamese and is the first person in his family to compete high school, let alone study at a university. Shige Sakurai (they/them) is a pioneering educator, administrator, and advocate for intersectional diversity and inclusion in international education. Shige’s efforts have resulted in new professional development opportunities in our field, particularly around LGBTQ+ social justice. Shige, a transgender person of Japanese descent, began their internationalism journey both through family – growing up in a binational household – and by studying abroad in a specialized gender and sexuality semester program in the Netherlands. During that program, Shige researched the intersections of immigrant cultures, sexuality, and educational policy in the Netherlands. Over the years, Shige has presented on LGBTQ+ and intersectional diversity widely across our field, including for the U.S. Department of State, World Learning, Global Ties U.S., University Studies Abroad Consortium, Diversity Abroad, and NAFSA: Association of International Educators. In addition to creating unique, cutting-edge LGBTQ+ cross-cultural experiences for U.S. students in Mexico and Thailand, Shige has brought international LGBTQ+ advocates for speaking engagements or to serve as fellows on U.S. campuses, advancing discussions on asylum/refugee issues and human rights in such countries as Nepal, Jamaica, Guyana, and Malawi. In 2014, Shige catalyzed Somewhere Over the Rainbow: Conference on Sexual Orientation and Gender Identity in International Education. Shige currently serves as the Director of Leadership Initiatives and Associate Director in the LGBT Equity Center at the University of Maryland, College Park; faculty for American University’s International Training and Education Program; and executive education faculty for University of Southern California’s Race and Equity Center. Becca AbuRakia-Einhorn is the Coordinator of Education Abroad at Gallaudet University, the world’s first and only university designed to be barrier-free for Deaf, DeafBlind, DeafDisabled, & Hard of Hearing students. She received her BA from Pomona College in Claremont, California where she majored in Media Studies. She has an MA in International Affairs from American University’s School of International Service and an MPA from American University’s School of Public Affairs. In her position, Becca supports all students who wish to intern, study, or volunteer abroad during their time at Gallaudet. At the University, she serves as the advisor for the Fulbright Student Program, the Critical Language Scholar program, the Boren Fellowship, and the Gilman Scholarship. She also advocates broadly in the field of International Education for Deaf students (as well as all students with disabilities) to have increased access to study abroad programs. She is a graduate of the NAFSA Academy program for International Educators and presented at the NAFSA National conference in 2018 and the CIEE National Conference in 2018. Outside of work she is a StartingBloc Innovation Fellow and a New Leaders Council Fellow. Traveling, studying, and living abroad opened doors for her and she is passionate about helping young people of all backgrounds find ways to explore the world. Dr. Amer F. Ahmed is an organizational strategist who helps institutions and leaders address diversity and inclusion, equity, race, and intercultural development through consulting, coaching, group facilitation, and keynote speeches. A frequently requested speaker nationwide, Dr. Ahmed’s approach is grounded in social justice and commitment to community. He brings his identity as the son of Indian Muslim immigrants and extensive years as an intercultural and diversity consultant as the sources of a pivotal understanding of the depth of diversity and inclusion work. Throughout his career, Dr. Ahmed has worked with large organizations, higher education institutions, non-profit agencies, schools and community groups to create understanding and change among key constituents and institutional leaders. His thought leadership and keen sense of the latest trends informs his approaches to helping groups address potential areas of opportunity to grow and develop. Dr. Ahmed incorporates deep theoretical knowledge of the field combined with a variety of methods including storytelling, discourse on current events and connections to art and music in order to move audiences to profound awareness of issues and next steps. He has published key opinion pieces and has been featured in media such as MSNBC, documentary film, and other national press outlets for his commentary and critical perspective on news and significant topics in society. Dr. Ahmed is the Founder and CEO of AFA Diversity Consulting, LLC, a consulting practice dedicated to enhancing the development of organizations through efforts around leadership, professional development, assessment, and strategic change. In addition to his consulting work, Dr. Ahmed serves as Director of Intercultural Teaching and Faculty Development at University of Massachusetts – Amherst, Faculty at the Summer and Winter Institutes for Intercultural Communication, and is a member of SpeakOut: Institute for Democratic Education. Johnny C. Taylor, Jr., SHRM-SCP, is President and Chief Executive Officer of the Society for Human Resource Management (SHRM), the world’s largest HR professional society. Under his leadership, the Society has grown to a record 300,000 members in over 165 countries who impact the lives of 115 million workers every day. As a global leader on human capital, culture and leadership, Mr. Taylor is a sought-after voice by C- suite executives as well as state and federal elected policy makers on all matters affecting work, workers and the workplace. He is frequently invited to testify before Congress on critical workforce issues—from sexual harassment to paid leave—and authors a weekly column, “Ask HR,” in USA Today, the country’s largest newspaper. Group USA. Most recently, Mr. Taylor served as President and Chief Executive Officer of the Thurgood Marshall College Fund, which advocates and represents publicly supported Historically Black Colleges and Universities (HBCUs). Mr. Taylor serves on the corporate board of Gallup, the world’s leading public opinion and consulting firm. He also actively volunteers for education, employment and other social causes by serving on the boards of the University of Miami, Jobs for America’s Graduates and the American Red Cross and as an adviser to Safe Streets & Second Chances, an initiative to reduce the high rate of recidivism among the formerly incarcerated. In 2018, he was appointed Chair of the President’s Advisory Board on Historically Black Colleges and Universities by President Donald J. Trump. Mr. Taylor holds both a Doctor of Jurisprudence and a Master of Arts with honors from Drake University. He obtained a Bachelor of Science with honors from the University of Miami. He is licensed to practice law in Florida, Illinois and Washington, D.C.
We approach this deep dive on EA advising practice from Yosso’s (2005) Community Cultural Wealth (CCW) construct, which suggests that historically underrepresented students bring a rich range of unique strengths that can make them stronger university students. We then introduce deep dive attendees to Appreciative Advising and help them create a culturally-responsive approach to advising, which can allow them to forge stronger relationships with diverse students and empower them to achieve their international educational goals. Although the number of students with disabilities who study abroad has increased, the number with learning, sensory, and physical disabilities has decreased. How do we understand this? What practices can support students with disabilities to ensure access and successful engagement in the study abroad experience? Join us in a panel discussion with at least 3 study abroad participants who have varying disabilities, and learn from their perspective on navigating the study abroad experience. This session explores whether gender parity (the ratio of women to men) has been achieved within International Education’s senior leadership level. It includes a presentation of the results of 2017/18 related research, insights into the lived experiences of women senior leaders, including stories from women of color, and a discussion about the barriers and opportunities for women leaders to move up the leadership ladder. The Gilman Scholarship Program named their “Top Producers” for the first time at last year’s Diversity Abroad Annual Conference. Four of these Top Producing Institutions will present their successful strategies to promote inclusive study abroad. Institutional categories included Small, Medium, Large and Associate Colleges and Universities. Each has developed customized techniques to reach their own diverse populations to promote study abroad and the Gilman Scholarship – the largest undergraduate study abroad scholarship in the nation. This session addresses the need for study abroad advisers and program administrators to pursue student-specific approaches to support and empower heritage students. The session brings together on-campus advisers and program provider perspectives on supporting heritage students in the pre-departure, on-site, and re-entry phases. Attendees will hear first-person accounts of heritage student experiences abroad, and will leave the session with a roadmap for engaging with and advising heritage students on campus and while they are abroad. A thriving international education program comes out of a dynamic network of campus allies and collaborative programming. Explore how to cultivate diversity, equity, & inclusion initiatives with various stakeholders and work through barriers from the perspective of varied institutions with distinct organizational programs. Examine how to develop mutually beneficial objectives with other offices and groups. The session will include a panel and interactive activities on engaging potential allies, creating programming, and strategies for navigating challenges. This session will provide an overview of social justice concepts and how to implement those in the Education Abroad curriculum to enhance students’ experiences abroad. The purpose of the curriculum is to maximize students’ experiences abroad by promoting self­-reflection and the development of empathy and understanding prior to departure. Student success is a shared goal on college campuses as well as within the organizations who support them. To ensure international programs lead to greater student success, academically, interpersonally, and professionally, it’s critical that the advising and support structures in place are inclusive and address the needs of diverse students. This track will explore inclusive practices for advising and support of diverse and underrepresented students before, on-site, and after participating in international programs. Additionally it explores how various campus units, such as diversity & multicultural offices, career centers, disability or TRiO offices, have a role in supporting on-campus international students and student success through international programs. Dr. Eneida O. Roldan is the Associate Dean for International Affairs for the Herbert Wertheim College of Medicine and Chief Executive Officer of the Health Care Network at Florida International University. Prior to joining the College of Medicine in 2009 as founding faculty, Roldan was the immediate past Chief Executive Officer and president of the Jackson Health System Public Health Trust; and prior to that she was senior vice president, associate Chief Medical Officer, and Chief Administrative Officer for Jackson Memorial Hospital. Born in Cuba, Dr. Roldan migrated to the USA with her family at the age of two. Dr. Roldan served her residency and fellowship in Pathology and Pediatric Pathology at the University of Miami School of Medicine, Jackson Memorial Hospital and affiliated hospitals between 1981-1985 and 1985-1987, respectively. She holds a Master of Public Health with honors from the University of South Florida and a Master of Business Administration with highest honors from the University of Tennessee. Until 1989, she served as faculty at the University of Miami, at which time she decided to pursue the field of weight management, nutrition, and eating disorders. Dr. Roldan was the Founder and Medical Director for the Center for Bariatric Management in Miami, Florida, where she practiced in the field of weight management for 12 years and participated in national clinical studies in adults, adolescents, and children in the field of obesity. Juliana is a trilingual Human Capital professional with over 10 years of HR experience combined with a Finance educational background. A multicultural and multidimensional dynamic leader and facilitator with exceptional strategic, operational, analytical and organizational abilities. Expertise in multiple human capital disciplines such as coaching, diversity and inclusion, talent and leadership development, learning strategy and facilitation, employee engagement, recruitment, retention, and performance management. Results-oriented and effective in guiding self and teams to produce high performance metrics. Promoted to positions of increased responsibility and engaged in strategic projects. Juliana was born and raised in São Paulo, Brazil. Her family then moved to Caracas, Venezuela where they remained for 4 years during one of Venezuela’s most challenging political times. Juliana then moved to the United States where she finished her high school education and attended Florida Atlantic University in Boca Raton, Florida. She achieved two Bachelor’s Degrees, in International Business and Finance which propelled her to work with the financial services industry at Franklin Templeton Investments for 4 years. Upon promotion, she uprooted to Barcelona, Spain for 2.5 years to obtain two degrees – a Master’s in International Business & Commerce and a Post Graduate degree in Valuation. She returned to the United States and resides in Miami, Florida with her 5 year old son working in Human Capital for PwC. After serving as Provost and Chief Academic Officer for more than a year, Dr. Wayne A. I. Frederick was selected as Howard University’s interim president in October 2013. On July 21, 2014, the Board of Trustees voted to appoint Dr. Frederick as Howard’s 17th president, after a unanimous recommendation by the University’s Presidential Search Committee. Frederick was a participant in Howard’s rigorous B.S./M.D. dual degree program, allowing him to earn both degrees by the age of 22. He also received a Master of Business Administration degree from Howard University’s School of Business in 2011. Dr. Frederick continues to operate and lecture actively; the focal point of his medical research is to narrow the disparity in all cancer-care outcomes, with a focus on gastrointestinal cancers. A distinguished researcher and surgeon, Dr. Frederick has also received various awards honoring his scholarship and service. In January 2017, The Federal Reserve System Board of Governors elected Dr. Frederick to the Federal Reserve Bank of Richmond’s Baltimore Branch, and in May 2016, President Barack H. Obama elected Dr. Frederick to the Board of Advisors for the White House Initiative on HBCUs. In April 2016, Dr. Frederick became a member of the American Surgical Association, known as the nation’s oldest and most prestigious surgical organization. Dr. Wayne A. I. Frederick is a true son of Howard University—a proud and loyal exemplar of Howard University’s motto: Truth and Service. Saif’s professional career includes being a startup technology entrepreneur and an executive in agricultural and engineering companies. Saif earned his bachelor’s degree in Foreign Service from Georgetown University and his Juris Doctorate from the University of Miami School of Law. Saif’s personal and professional life has been defined by a commitment to developing young people, building civic institutions, international dialogue, and entrepreneurship. Charles Sasaki is Dean of Academic Affairs at the University of Hawaii – Windward Community College where he serves as Chief International Officer and collaborates with faculty and students in STEM, Social Sciences, and Career & Technical Education. He previously serves as Fulbright Alumni Ambassador for the Institute of International Education providing volunteer outreach on behalf of the Council for International Exchange of Scholars. Sasaki began his career as faculty in American Ethnic Studies and has a particular professional interest in the success of students of color, first-generation, and economically disadvantaged students. He is actively engaged in the community of Asian American Native American/Pacific Islander (AANAPISI/MSI) institutions. A two-time Fulbright scholar (Germany, 2008; Russia, 2012) Sasaki has also traveled with Fulbright-Hays to Japan and on a NASPA professional exchange to the United Kingdom. He is currently PI for a Capacity Building for Study Abroad grant from Partners for the Americas to create new study abroad programs to Whakatane, New Zealand & London, England. Dr. ‘Dimeji Togunde serves as the Associate Provost for Global Education and Professor of International Studies at Spelman College. In his capacity as Spelman’s Chief International Officer, Dr. Togunde provides guidance and direction for all of the college’s global initiatives with responsibilities for building/strengthening strategic international partnership engagements aimed at enhancing student exchanges, faculty and students’ research, and students’ global learning experiences. Reporting directly to the Provost, he oversees the Office of Study Abroad, Office of Cultural Orientation, G-STEM Program, International Affairs Center, International Student Services and Advising, and all study abroad programs directed by faculty and staff. Dr. Togunde also leads the assessment of the college’s internationalization initiatives and collaborates with academic departments to encourage greater awareness of and involvement with the realities of globalization. Under his leadership, Spelman won the 2017 Senator Paul Simon spotlight award for campus internationalization. Prior to joining Spelman College in August 2011, Dr. Togunde spent 15 years at Albion College in Michigan, where he held the John S. Ludington Endowed Chair in the Social Sciences as Professor of Sociology, and served as Chair of the Department of Anthropology/Sociology, chair of global studies curriculum and Director of the Ethnic Studies Program. He received both his Bachelor and Master’s degrees in demography and social statistics from the Obafemi Awolowo University in Nigeria, and a Ph.D. in Development Sociology from Cornell University. Dr. Hilary Landorf is the founding Director of the Office of Global Learning Initiatives at Florida International University. She oversees FIU’s university-wide initiative, Global Learning for Global Citizenship, winner of the Institute of International Education’s 2016 Heiskell Award for Internationalizing the Campus. She is an Associate Professor in the School of Education and Human Development, and leader of FIU’s Master of Science degree program in International and Intercultural Education. In 2016, she was appointed as the Executive Director of the Comparative and International Education Society, bringing the Office of the Executive Director to FIU. Landorf’s expertise centers on visioning, developing, designing, and implementing the policies and practices of global learning efforts in higher education. She has written, consulted, and presented internationally on integrating global learning in K-20 educational settings. She received her PhD from New York University in Humanities and Social Sciences in the Professions. Since President Abdullah’s inception in 2016, Virginia State University has benefited from his leadership with, among other achievements, 30 percent and 50 percent increases in freshman enrollment in 2016 and 2017 respectively. Also under his leadership, the university was recognized as one of the nation’s top 20 “Best Colleges for African Americans” by ESSENCE magazine, it has established partnerships with local public school systems wherein VSU students tutor students in mathematics and reading, and opened the Academic Center of Excellence as a one-stop hub for first-year students to receive career, academic advising and tutorial services. In 2017, President Abdullah was named the HBCU Male President of the Year by HBCU Digest. President Abdullah is an academic administrator committed to excellence. He is also an internationally-renowned educator recognized for outstanding research. Prior to his appointment as president of Virginia State University, Dr. Abdullah served as provost and senior vice president at Bethune-Cookman University (2013-2016), provost and vice president for academic affairs at Florida Memorial University (2011-2013), and dean and director of Florida Agricultural and Mechanical University (2008-2011). President Abdullah is a Chicago native who is the youngest African American to receive a Ph.D. in Engineering. He earned his undergraduate degree from Howard University in Civil Engineering and a Master of Science in Civil Engineering from Northwestern University. Mark B. Rosenberg is the fifth president of Florida International University, a public institution of higher education and leader in the production of minority degrees in the sciences and engineering among majority-minority institutions. A political scientist specializing in Latin America, Dr. Rosenberg is the first FIU faculty member to ascend to the university’s presidency bringing over forty years of experience in higher education leadership to this post. The author of seven books and numerous scholarly articles on Latin America, Dr. Rosenberg was one of the principal architects of FIU’s growth and expansion during the past decade and played a lead role in development of FIU’s Herbert Wertheim College of Medicine. Under his leadership as president, FIU has increased enrollment to almost 56,000 students, improved graduation rates by nearly 13% and hired over 500 new faculty. Dr. Rosenberg has provided leadership to grow the institution’s budget, improve student graduation and retention rates, expand internships for enrolled students, and coordinate FIU’s emergence as a leading producer of graduates in priority national and state areas focused on science, technology, engineering and math (STEM). From 2005 to 2009, Dr. Rosenberg served as the second Chancellor (first formally selected by the Board of Governors) for the State University System of Florida. Prior to becoming chancellor, Dr. Rosenberg was integrally involved in the expansion and development of FIU into a major public research university. Dr. Rosenberg holds a Ph.D. from the University of Pittsburgh and a B.A. from Miami University of Ohio, where he was Phi Beta Kappa. He is a Fulbright Research Scholar; a member of the Council on Foreign Relations in New York; the immediate past-Chair of the Greater Miami Chamber of Commerce (GMCC); the Chair of the National Academies of Sciences, Engineering and Medicine’s Committee on Developing Indicators for Undergraduate STEM Education; and the Chair of the Coalition of Urban Serving Universities (USU). Dr. Eduardo Padrón is the President of Miami Dade College, a national model of student achievement and the largest institution of higher education in America. In 2016, President Barack Obama awarded him the Presidential Medal of Freedom, the highest civilian honor in the U.S., for being a prominent national voice for access and inclusion in higher education. In 2009, Time magazine included him among the “10 Best College Presidents” in the United States; in 2010, Florida Trend magazine named him “Floridian of the Year”; and in 2011, The Washington Post recognized him as one of the eight most influential college presidents nationwide. He is the recipient of the Carnegie Corporation’s Centennial Academic Leadership Award, the National Citizen Service Award from Voices for National Service, and the Hesburgh Award, the highest honor in U.S. higher education. He is also an Ascend Fellow at the Aspen Institute. Six American Presidents have selected him to serve on posts of national prominence. He serves on the boards of the Council on Foreign Relations, the White House Fellows Selection Panel, and the International Association of University Presidents. He is the past chairman of the Business-Higher Education Forum, the American Council on Education and the Association of American Colleges and Universities. Introductory comments will include a brief overview of the panelists and speakers who have been invited to share their expertise, as well as tips for how to maximize attendees’ participation. This lunch and learn opportunity will feature a panel of social justice community organizers, and activists who will share the ways in which they have infused social justice principles and practices into their programming, campus or organizational culture(s), and/or work environments(s). This opportunity is a must for those committed to social justice and equality for all. We all have a role to play in creating a socially-just world – be a part of the change! Network with conference attendees over breakfast. Members of the Diversity Abroad Network Task Forces are invited to meet as a group to discuss initiatives. The Professional Pathways in Global Education Forum provides an opportunity for conference attendees to hear from seasoned professionals representing four sectors of global education: Education Abroad Office, Third Party Provider, Incoming International Student Support Services, and Social Entrepreneurship. An expert panel of diverse backgrounds will provide insight into the job market outlook for each of the aforementioned sectors, with focus on the specific skills and experiences employers are seeking in applicants. Following the moderated panel, attendees will join table conversations with key representatives from each industry to foster meaningful connections and answer industry-specific questions. As part of this session, attendees will receive a resource sheet outlining the top tips for career advancement in each sector. Whether or not a job search is in your future, this session will include key perspectives on how to continue growing as a Global Education professional. Interested in learning about how to maximize Diversity Abroad resources to meet your diversity & inclusion goals? This session will provide a short overview of organizational resources & updates, membership, and opportunities to stay engaged with Diversity Abroad. How can Education Abroad Offices move beyond the tacit commitment to diversity & inclusion efforts, and develop an inclusive climate that both welcomes students from diverse and underrepresented backgrounds and also effectively supports their successful participation and transformational learning throughout? Learn about Diversity Abroad’s innovative approach to assessing the overall climate of inclusion throughout the education abroad process through the Access, Inclusion, and Diversity (AID) Roadmap. As participation in education abroad has expanded, the need to understand the nuances of the many types of students who participate has increased. Although education abroad has evolved over time, and the definition of diversity has widened, the research on certain student populations has not kept pace. This session provides an overview of this research, shows the gaps, and suggests pathways to strengthen our understanding of underrepresentation in education abroad in order to enhance access and foster inclusive excellence. Although we know meaningful engagement with diversity benefits all students, little has been done to create a framework that utilizes universal global learning to achieve inclusive excellence. In this session, Landorf and Doscher explore the collaborative leadership model they use at Florida International University that they detail in their forthcoming book, Making Global Learning Universal: Promoting Inclusion and Success for All Students (Stylus, January 2018). The model’s six components can be customized to meet the unique needs of any institution. Session participants reflect on how the components are or can be realized in multiple demographic and institutional contexts. Challenging the rhetoric behind traditional versus non-traditional study abroad sites. This session will highlight the impact that advisors have on reinforcing outdated practices or revolutionizing study abroad by incorporating the voices of the changing student demographic. Everyone is invited to join this conversation, especially, university practitioners and program providers! In this session, participants will gain insight on how to prepare U.S. student activists and advocates to navigate racial/identity-based social justice issues across different cultural contexts in their host country and in the U.S. The session will also address strategies and best practices for managing student expectations and safety around civic participation and protest abroad, and guiding students through re-entry into an ever-evolving U.S. social justice climate. Innovation grant competitions support institutional capacity to advance the mission of internationalizing U.S. campuses. As seen through Partners of the Americas Grants, cooperative partnerships between the public and private sector allow for new opportunities to support piloting or expanding study abroad programs. This session is designed to provide professionals with best practices and resources to boost education abroad. The Partners of the Americas grantees will share their insights and tips for leveraging funds using seed funding from the 100,000 Strong in the Americas Innovation Fund or the Capacity Building Grant for U.S. Undergraduate Study Abroad grants. Program directors must be equipped with the strategies and tools for engaging students to explore diverse social group identities in-country and help students reflect and adapt to their own changing identities while abroad. In this session, participants will learn how to lead or how to work with program directors so that they can lead safe, authentic and effective dialogues or ‘courageous conversations’ abroad so that all program directors and students can reach their fullest potential. Sharing the responsibility for inclusive excellence requires all international educators to critically examine our identities, privileges, and experiences of oppression. This session guides participants to unpack their diverse identities through participatory exercises that challenge us to see how all our identities impact all aspects of our lives. From these shared experiences we will present examples of how we engage students and educators from all backgrounds (including White, cis-gender, heterosexual, able-bodied, able-minded, and others) in these conversations. Participants will leave with concrete ideas to broaden identity discussions and motivate all students and professionals to foster greater inclusive excellence in education abroad. Health and safety are critical components of education abroad (pre-departure planning and preparation, during the education abroad experience, and upon re-entry). Considerations for diverse students are essential when developing inclusive health and safety policies and procedures. This pre-conference workshop will provide participants with the tools, knowledge, and insight to create or enhance their education abroad health and safety protocols and practices, with foci on mental health, racism and other forms of discrimination, and sexuality. It will also equip participants with advising strategies and opportunities to engage with colleagues around applying standards of good practices. The lure of strategic and targeted marketing tactics to recruit students of diverse identities and backgrounds may make sense on the surface level as institutions and/or organizations attempt to create much needed exposure and access to education abroad. However, does targeted outreach pose ethical dilemmas or press proverbial hot buttons? What standards of practice can be employed to navigate the marketing landscape for increased access to diverse student demographics? 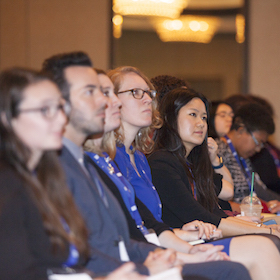 This pre-conference workshop will engage participants in thought-provoking dialogue, providing them with strategies and practices to inventively harness communication and marketing tools to create high-impact opportunities for diverse students and innovative, principled marketing solutions that appeal to targeted student populations. 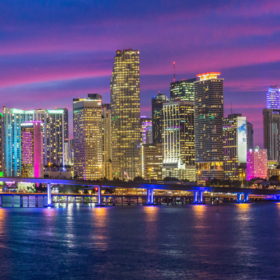 The metropolitan hub and surrounding suburbs of Miami, Florida are home to many vibrant immigrant and diasporic communities. Spanish is spoken by more than 20 percent of Florida’s population, with high usage in the Miami-Dade County area. Florida has one of the largest African-American populations in the country, and the second-highest Latino population on the east coast outside of New York state. This pre-conference workshop will engage participants in activities and discussion about best practices for working with immigrant student populations, and students from a wide variety of Diasporic backgrounds. It will also present a case study on the local Cuban and Haitian population and an opportunity to visit cultural and historical landmarks in Miami to engage with local communities, particularly in Little Havana, home to a majority of Cubans and Cuban Americans. Education abroad offices and provider organizations can benefit from formalizing their diversity and inclusion efforts into a cohesive plan to broaden access and engender inclusion in international education. This pre-conference workshop will examine the process for and components of engaging multiple stakeholders in the development of a diversity and inclusion strategy for education abroad, as well as strategies for implementing the plan with key partners at each phase of the process. Participants will be guided through a series of activities that will help them create an institution-specific diversity in international education strategic plan, including identifying key objectives, activities, and stakeholders (on campus and beyond), and developing a tentative timeline for the plan. As professionals working in the throngs of global and multicultural education, we have an integral role to play in modeling inclusive leadership from the inside out. How do we build a supportive and inclusive culture, not only for the diverse student body that we serve, but among colleagues? What are the hidden biases, assumptions, and stereotypes that unconsciously and consciously drive our behavior at work? This pre-conference workshop is designed for any professional interested in developing an inclusive leadership practice. Examples of tools and skill-building include: the Receive-Ask-Summarize-Appreciate (RASA) model for deep listening, the Redline/Greenline model for managing challenging emotions, and activities around unconscious bias. Participants will gain micro-practices to apply daily that will more likely lead to understanding, respect, and trust in the workplace. The renowned Wolfsonian Museum in Miami, Florida will be the backdrop for an intimate conversation with university presidents from minority serving institutions on how their institutional visions are shaped by personal global experiences. Our distinguished guests will also discuss the critical role they play in campus internationalization and the significance of global learning in a local context. The chat will be followed by a reception with opportunities to meet and/or reconnect with colleagues. Intended for professionals and graduate students who self-identify as women of color and/or allies for women of color, this lunch includes an intimate opportunity to connect with colleagues, and listen to and be inspired by dynamic speakers as they share their leadership journey, experiences and strategies for success in global education. Join us to connect and celebrate with colleagues. Celebrate our collective achievements as a field as we honor recipients of the Excellence in Diversity & Inclusion in International Education Awards and hear from the first-ever student recipients of the Academic Achievement for Research in Diversity & Inclusion in Global Education Award. 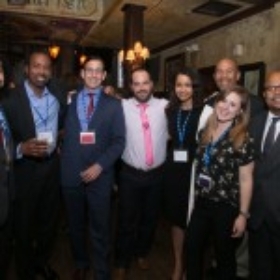 Join a small group of conference attendees for an intimate opportunity to meet or reconnect with colleagues and to engage in dialogue about what’s going on in the field while enjoying dinner at a local venue. Building on the annual tradition, a panel of diverse students will share their powerful stories and experiences abroad during lunch. Come listen to their narratives and connect with other students. 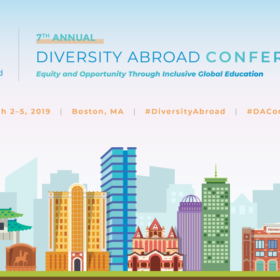 Join us as we kick off the annual Diversity Abroad Conference with opportunities to meet and/or reconnect with colleagues! First time attending the Diversity Abroad Conference? 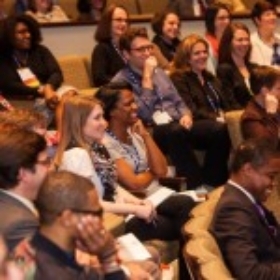 Find out how to make the most of your conference experience.